What to look for when developing an on-demand mobile application in 2019? On demand delivery app are currently in trend and are here to stay for a long time. To create such apps the mobile developer needs to have creativity, skill, knowledge, experience and a passion for technology. P2P (Person-to –Person) App: It is an app where person can demand a product or service from another person using the same platform. E2P (Enterprise to Person) App: E2P on demand delivery mobile app is the one where a person can demand product and service from an enterprise. E2E (Enterprise to Enterprise) App: This application refers to an app where an enterprise can get in touch with various other small enterprises. A strategy needs to be defined to get the mobile application developed, within the timeline, by a start-ups maintenance and upgradation of the app is also to be looked for to give perfect user experience to the customers. The following are the proven steps to be followed by start-up organizations for on demand mobile app design and development. Recognise and list the purpose of your app: On the basis of initial idea of application start-up should study the market, talk to few of target audience, users of competitorâ&#x20AC;&#x2122;s apps. Plan the app development: To check app idea, implement design, prototyping, launch of mobile app, the resources and budget should be strategized to get maximum results. Select a scalable development platform: In order to keep up with the trend, on demand app need a constant upgrade, maintenance, functionality addition. Investing in a non-scalable platform may result in revenue loss in the future. Bug-free and secure app development: It is extremely essential to keep the codes, screens and functionality bug-free and secure. To gain consistency be proactive in the collaborative efforts of the app development for designing, coding, testing and implementing the application as per the defined process. 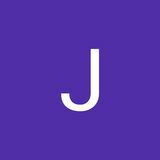 Launch the beta (MVP) version of the app: Allow people to experience your product is the best way to communicate the idea behind it. A fully functional MVP can do that in a matter of weeks not months. Analyse the feedback, engagement with the MVP will help you understand how your product should be changed or improved so that user will be curious to use it. Get updated with emerging new technologies: As the mobile technologies are changing at a rapid it is necessary for the the start-ups to keep the features up to date and efficient to give an extra ordinary user experience. You need to choose a start-up experts and enthusiasts as your associate partner for on demand app development requirements. Make mobile app that is user-friendly, customers can navigate easily, place and track their orders quickly, leave their feedback and share it. Effortless Payment Procedure: On demand Mobile application should serve customers with a wide range of payment options to deliver an exquisite experience to the users. Ratings and Reviews The users is able to check the ratings and reviews of the other customers and pick the service provider according to that. Include ratings and reviews features in your app. 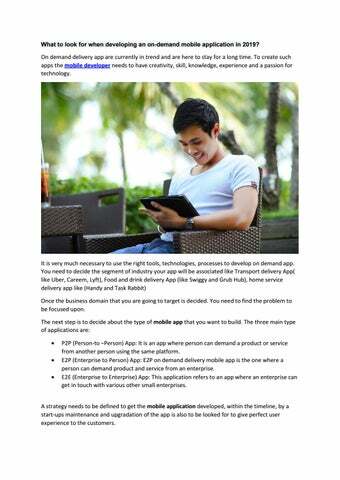 On demand delivery app are in current trend. It demands skills, knowledge and experience you need to be certain that you hire the right team of app developers who have already build this type of applications.